The cats and dogs at the Williamson County Regional Animal Shelter (WCRAS) have written their list to Santa, and each and every one of them listed "Home" or "Family" as what they wanted most of all. Make their wishes come true by adopting or fostering a pet during the holidays this year. 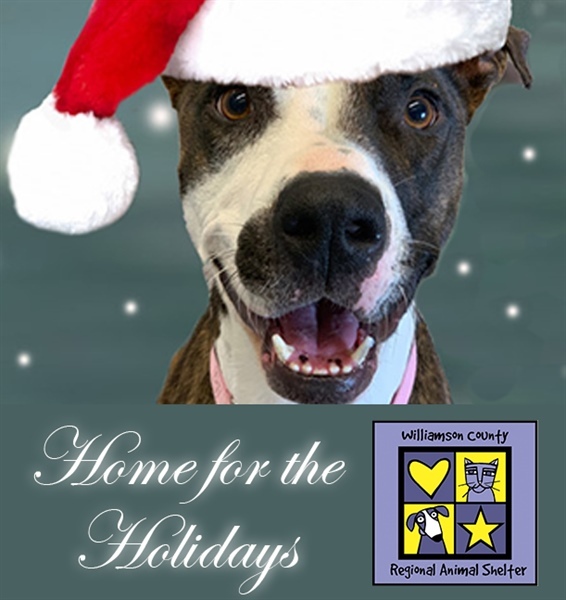 “Home for the Holidays” is a foster drive from December 1 through January 3 that saves the lives of the lost and abandoned pets of Williamson County and raises awareness about the importance of pet adoption during the holiday season. The short-term commitment of fostering saves lives by opening kennel spaces and gives the dogs and cats a much needed break from the stresses of shelter life. After fostering, the dogs and cats are healthier and happier – ready to find their forever homes. More families bring a new pet home during the holiday season than at any other time of the year. Foster families must fill out a foster application and present a valid photo ID. The shelter is responsible for the foster's medical needs and helps with training needs. The foster family loves and cares for the foster as if he or she were their very own. Fosters dogs and cats are all one year or older, spayed/neutered, microchipped, and vaccinated before they go into foster homes. Foster dogs and cats still will be available for adoption on the WCRAS website. Potential adopters can email wcras@wilco.org to get in touch with foster families. Foster families will either contact the potential adopters in 24 hours to chat about the foster pet or contact the shelter in 24 hours to complete the adoption. Adoption fees are the special at that time. For the month of December, all adult dogs and cats are only $12 to adopt, kittens and puppies are only $75 to adopt. Visit the Williamson County Regional Animal Shelter website to view adoptable animals and for more information. Foster families can easily fill out a foster application and search for potential holiday fosters at the shelter’s website.